The restaurant is rectangular in shape, and simply furnished with creamed walls and light pine wood floors. A skylight at the back of the restaurant allows natural light into the otherwise mostly windowless, low-ceilinged room. We chose from the three course set lunch menu for £29, the most appealing aspect of which is that there are four choices per course, rather than just the usual two or three offered at most other restaurants. For an additional £5, it is possible to have the same menu with a half bottle of wine (although not necessarily a great wine). The à la carte menu is priced at £68. 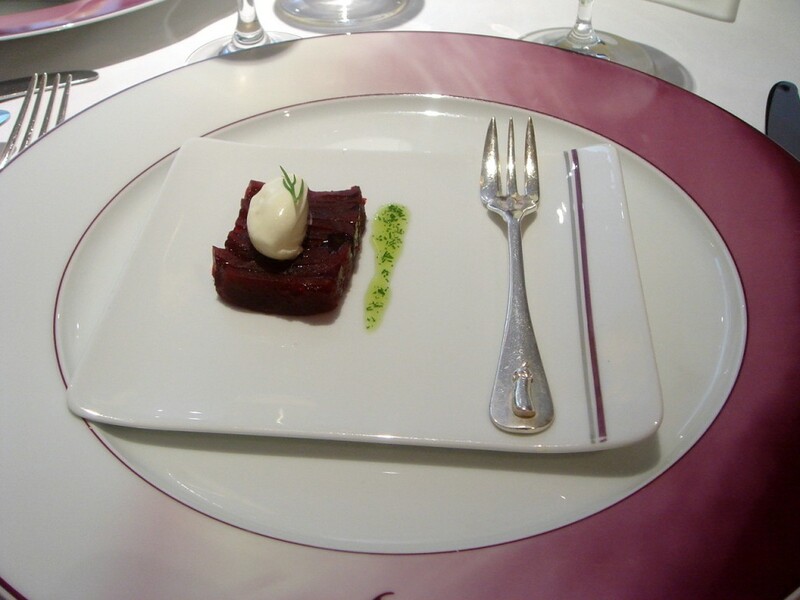 We started with an amuse bouche of beetroot ‘terrine’ topped with sour cream and a drizzle of chive sauce on the side. This dish tasted like pickled beetroot and was too vinegary for my liking, although the topping of sour cream helped to cut the acidity. The chive sauce was bland, and achieved little purpose other than to give this plate a little colour. Overall it was a rather unsophisticated start to our meal. A starter of foie gras mousse, a cooked mousse, was quite eggy. A nice tasting dish, it lacked a strong foie gras taste. Admittedly we were on the budget menu and foie gras is an expensive ingredient. But my preference for a cheaper menu would always be for cheaper ingredients to be done well, rather than more expensive ingredients being used compromisingly. It came with asparagus and potato fries perched on top. The asparagus were done nicely in butter, but the fries which were dreadful. They tasted like they had been pre-cooked and reheated, with a soggy exterior. 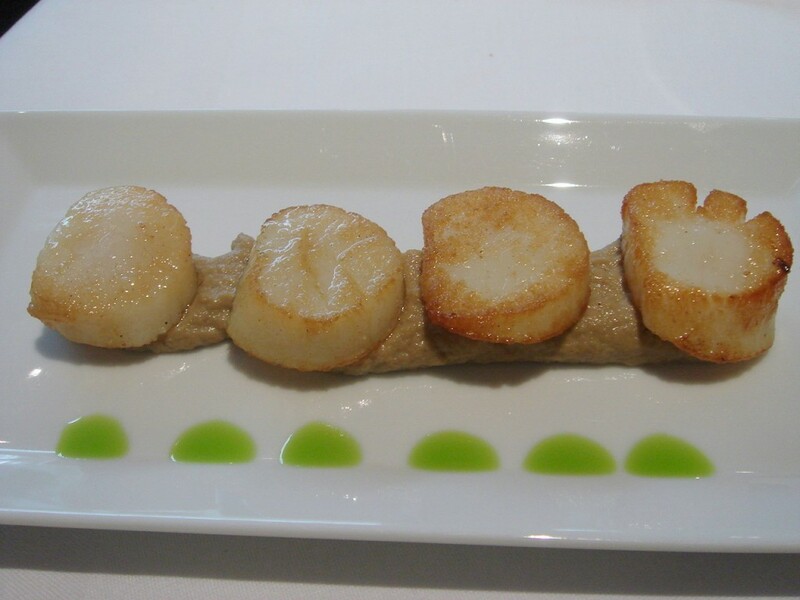 Another starter of scallops (four pieces thinly sliced) was served over a puree of mushroom. The scallops were well cooked, and the puree was pleasant. 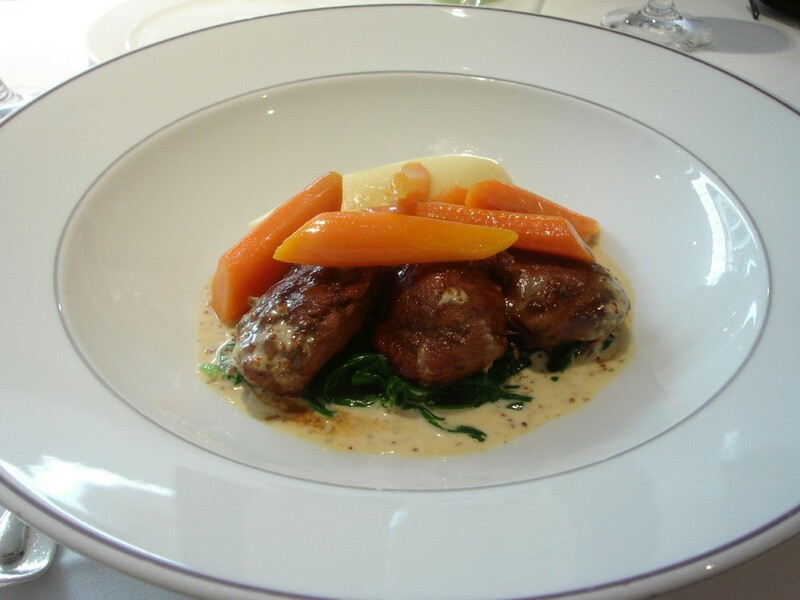 A main of braised pork cheeks with mustard sauce was meltingly tender; and the sauce was lovely. However, the sides disappointed with the carrots being over seasoned and the mashed potatoes yielding a rather waxy texture. Furthermore, there was carelessness in the preparation for I found a piece of black hair, about two inches long, in the pork dish. We speculated as to whether it was human hair, but the waiter who came and spoke with us on the matter informed us it was a piece of pig’s hair which had accidentally not been removed during prep. Either way, it should not have been there. A fish course of John Dory was cooked nicely, but it came with a parsley crust which I found superfluous. It was bland, with no distinctive flavour of parsley, and also quite thick with a floury taste. It therefore overwhelmed, rather than complimented, the dish. 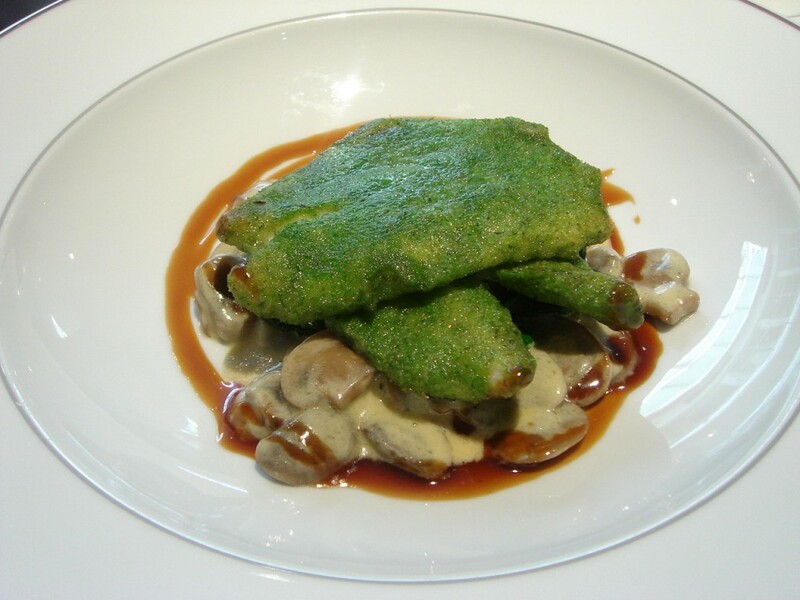 The John Dory was bedded over nicely cooked spinach, creamed mushrooms and a red wine sauce, but the choice of mushrooms, button ones, was rather unexciting. Desserts were by far the best things that we ate on that day. 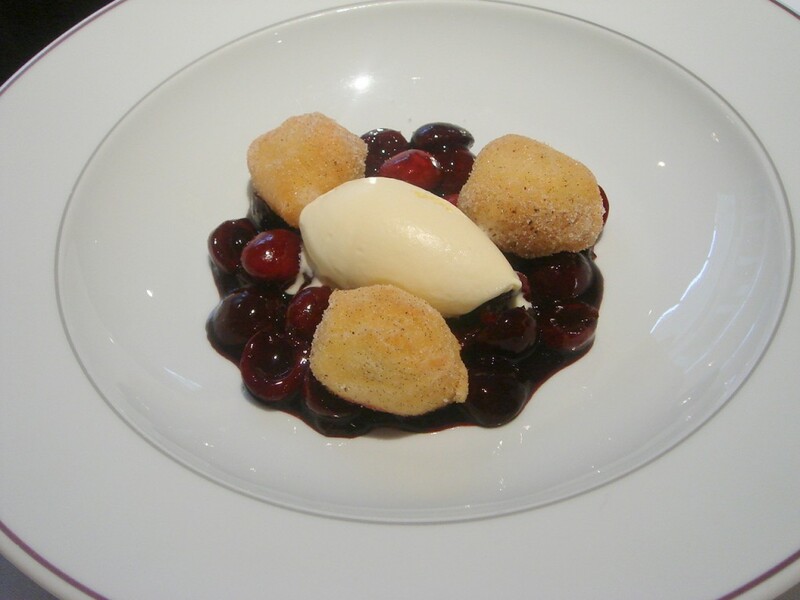 Poached cherries with soufflé beignets were lovely; the cherries naturally sweet, and the beignets light and fluffy on the inside with a nice crispy exterior. 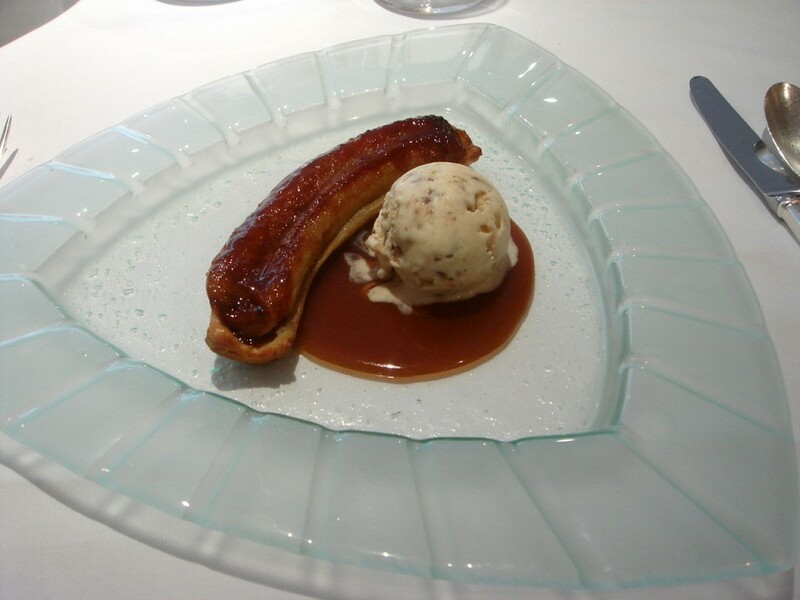 A banana tarte tatin was also pleasant although the pastry was not as crispy as it could have been. There was a variety of bread rolls on offer, all baked in-house. The range included white, brown, sesame, dill, black olive and rosemary. The breads were acceptable, although I found them to be rather tasteless with perhaps the exception of the dill bread. Petit fours were really lovely with a lemon tart packing a sharp citric punch. Service was acceptable, but could perhaps have been slightly better managed. We were primarily served by a French waitress who could not really speak English, which meant communication with her was a bit difficult. Furthermore, in another slightly careless move, I was not presented with a menu when I first sat down to join my dining companion who had arrived before me, and it was only when I asked for one after several minutes that I actually received one. Overall, our lunch was a rather average affair. The food was lacklustre and unspectacular. It also lacked passion and ambition, and in my mind, I found it hard to reconcile it to the level of other one Michelin one star restaurants that I have been to. The cooking was competent enough, but mere competence does not a Michelin make. Billy Drabble was in the kitchen during our visit, and so there was no blaming a more junior chef. Occasionally, I am disappointed by a dining experience in a restaurant which bears a star, and I am sad to say that this was one of those times. Prices are listed above. Excludes drinks and service. Shame – my ex boyfriend took here for a stunning meal on my 21st birthday. I think it was the first time I’d had a tasting menu and I was quite gobsmacked. I have found these budget lunches to be quite disappointing over all. So are there any cheaper and more exciting mushrooms than the button variety…? Hi Lizzie, Yes it is a shame. Sometimes the budget lunches can be quite good. I think the ones at Murano and Greenhouse are quite good value. I accept you will get lesser, cheaper ingredients on the budget menus, but this shouldn’t compromise on the cooking. Furthermore, there’s never an excuse for hair in the food. 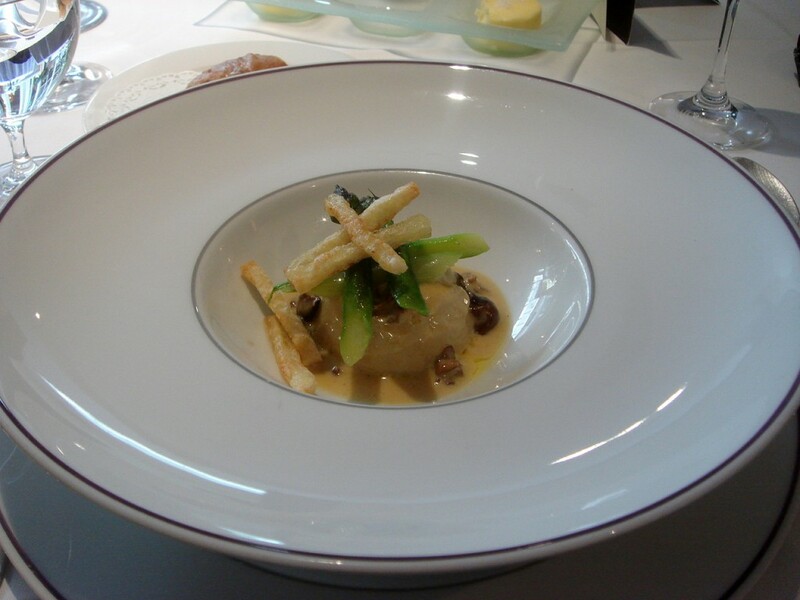 I thought the dish would have worked better with perhaps wild mushrooms, even if a smaller quantity of it. Sounds like a very average meal with some element which are not particularly imaginative at all. I mean, I love simple too but if dishes are incredibly simple like the scallops then I would expect them to be perfect and with even caramelisation. That John Dory also looks just scary to be perfectly honest! I can’t get over the eggy foie gras mousse. So sorry this was such a disappointing meal. Anyways… 1 more exam to go and I should (hopefully) be done with Uni… for good. Makes me sad actually! I ate at Trinity in clapham the other day and it was a perfect example of what you said about quality cooking with reasonable priced food rather than substandard cooking with expensive ingredients. £70 for a taster menu including wine and I left content and inspired without an ounce of foie gras passing my lips. Couldnt agree more with this review . We went for the lunch menu and it was shocking . I had a duck confit that wasnt merely overcooked , it was burnt to a crisp and yet they had the audacity to bring it to my plate . One didnt need to taste it to realise it was awful . I dont know how many ‘eyes’must have seen that dish before it was placed infront of me .Astoundingly i was offered a complimentary desert wine with my next course rather than offering me another main course . The place is living off its history and certainly doesnt deserve a star. Yes it’s a real shame when a restaurant rests on its laurels and trades on past glory. You were lucky to get a complimentary dessert wine. I was offered nothing despite having a piece of hair in my food. restaurant can get comfortable and rest on it’s laurels. and very warm (Maitre D’) and really the food was excellent. I have eaten in many Michelin star restaurants over the years and this really was Michelin star food. I also discovered that the Chef was no longer an Englishman (I thought he was- William Drabble) but that there was a new Chef and that he was French. Maybe they are not resting on their laurels after all??? ?